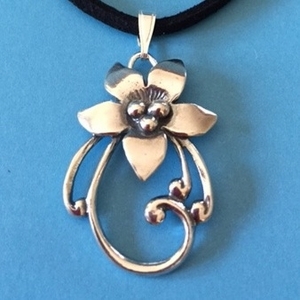 This piece is a Sterling Silver Pendant fashioned from an orphaned Toggle. Long time customers may recognize this beautiful Fancy Flower. When the toggles were shipped from MI to WA, many of these Flowers arrived without bars. These silver pieces were too beautiful to waste, so I turned them into a pendant by adding an oval jump and a medium sized snap bail. For illustration purposes, I photoed it on a black suede cord but it would be just as stunning on a silver chain. Check out our reasonably priced finished silver chains.